Chocolate packing machinery in Holland is achieving improved availability by the use of 3D printing for producing spare parts. 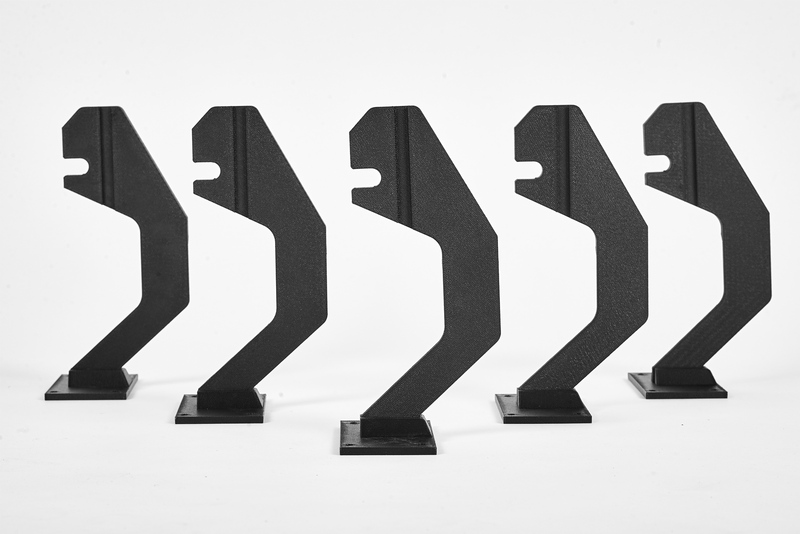 The Dutch 3D service bureau, Visual First, is using FDM Nylon 12CF carbon-filled thermoplastic from Stratasys to replace metal machine parts for its customer, The Chocolate Factory. The ability to 3D print machinery replacement parts on-demand has significantly reduced machine downtime, ensuring production line continuity for the company. Based in Rotterdam, Netherlands, The Chocolate Factory runs a network of packaging machines, with the company’s daily throughput relying on the smooth operation of a simple, yet crucial, hook-shaped metal part that lifts wrapped bars onto a conveyor belt. A problem occurs when the part malfunctions – typically with such regularity that it necessitates replacement three times a month. As each replacement part is handmade, delivery can take over a month. Van de Rijzen uses Stratasys’ high-performance FDM Nylon 12CF composite material, a carbon-filled thermoplastic containing 35% chopped carbon-fibre. Produced on the Stratasys Fortus 450mc Production 3D Printer, the 3D printed replacement machine part is currently being used at the factory. According to van de Rijzen, the team at The Chocolate Factory is impressed with the high stiffness-to-weight ratio of the FDM Nylon 12CF, resulting in parts of extreme rigidity. Following the success of the 3D printed replacement part, The Chocolate Factory is now turning to Visual First to solve other design challenges – most notably, to develop a prototype casting mould to test acceptance of its products. Traditionally this is made from plastic, which is both time consuming and expensive. “With 3D printed moulds created on the Fortus 450mc, the company will be able to further accelerate its production processes,” says van de Rijzen.